Sometimes you need to run that valgus post clear back to the heel! 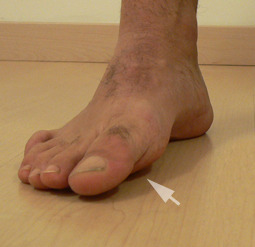 A valgus post assists in pronation. Some fols have modereate to severe internal tibial torsion and need to be able to pronate more to get the knee into the saggital plane for patello femoral conflicts. They usually run from the tail of the 5th metatarsal forward, but sometimes need to run it clear back to the heel to get enough pronation to occur. Last week we looked at one (of many) methods to make stretching more effective, utilizing a neurological reflex called “reciprocal inhibition” If you missed that one, or need a review, click here. Another way to get muscles to the end range of motion is to utilize a technique called “post isometric relaxation”. Notice I did not say to lengthen the muscle; to actually add sarcomeres to a muscle you would need to use a different technique. Click here to read that post. Contracting a muscle before stretching is believed to take advantage of a post isomteric inhibition (sometimes called autogenic inhibition), where the muscle is temporarily inhibited from contracting for a period immediately following a isometric contraction. This has been popularized by the PNF stretching techniques, such as “contract hold” or “contract relax” . EMG studies do jot seem to support this and actually show muscle activation remains the same (1, 2) or increased after contraction (3-6). Perhaps it is due to an increased stretch tolerance (7,8). The technique was 1st described by Mitchell, Morgan and Pruzzo in 1979 (9). These gents felt it was important to utilize a maximal contraction (using 75-100% of contractile force) to get to have the effect. It was later shown by Feland and Marin (10) that a more minimal, submaximal contraction of 20-60% accomplished the same thing. Lewit felt that a less forceful contraction offers the same results, and combined respiratory assists (inspiration facilitates contraction, expiration facilitates relaxation) with this technique (11). Interestingly, there are bilateral increases in range of motion with this type of stretching, indicating a cross over effect (12). Regardless of the mechanism, the phenomenon happens and we can take advantage of it. Bring the muscle to its end range (maximum length) without stretching, taking up the slack. This should be painless, as this will elicit a different neurological reflex that may actually increase muscle tone. resist with a minimal isometric contraction (20-60%) and hold for 10 seconds. You can inspire to enhance the effect. relax and exhale slowly. It is important to wait and feel the relaxation. Stretch through the entire period of the relaxation. You should feel a lengthening of the muscle. This technique can also be used with the force of gravity offering isometric resistance. In a hamstring stretch, you could lean forward while maintaining the lumbar lordosis and allowing the weight of the upper body to provide the stretch. Wasn’t that easy? Now you have another tool in your toolbox for yourself or your clients. The Gait Guys. Giving you useful information and explanations in each and every post. Mitchell F Jr., Moran PS, Pruzzo NA: An Evaluation of Osteopathic Muscle Energy Procedures. Pruzzo, Valley Park, 1979. Feland JB, Marin HN. Effect of submaximal contraction intensity in contract-relax proprioceptive neuromuscular facilitation stretching. Br J Sports Med. Aug 2004;38(4):E18. Lewit K: Postisometric relaxation in combination with other methods of muscular facilitation and inhibition. Man Med, 1986, 2:101-104.